"Congratulations to Kieran for qualifying for the 2020 Olympic Trials! 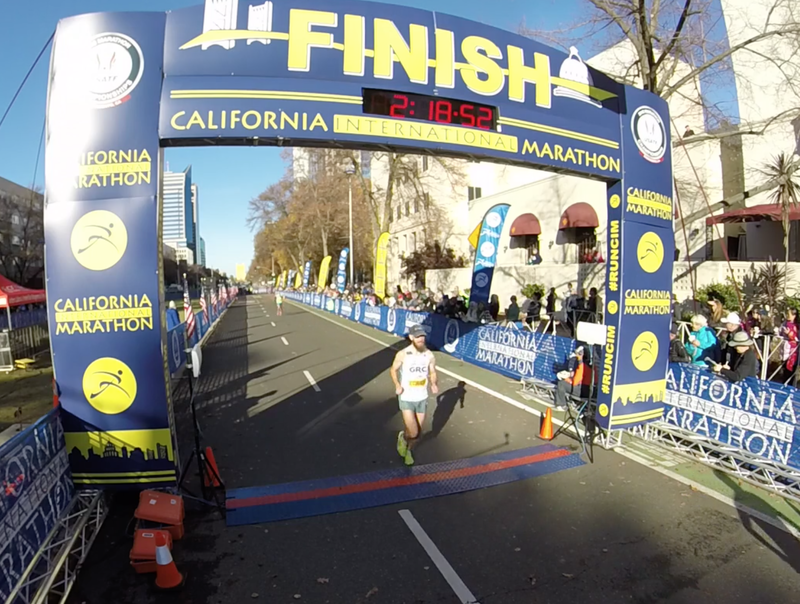 Kieran ran 2:18:52 at CIM, which is a PR, and the second fastest time in GRC history. Kieran had a fantastic training cycle, and he had Trials qualification written all over him. Kieran executed the plan on race day, running even pace throughout and picking guys off the second half of the race, despite dealing with some hamstring issues that made the task of qualifying more difficult than it otherwise would have been. This was another great run for Kieran, and I'm really excited for him to have a chance to improve on his fantastic finish at the 2016 Trials. Well done! 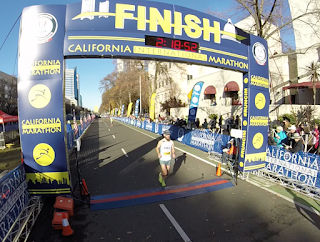 Kieran wasn't the only one of our athletes to run great at CIM. Sam D ran a 7 minute PR(!) of 2:19:52, which puts him third on the GRC all-time list. Sam put in a whole lot of miles this training cycle, and all of that strength paid off in a huge way as he was able to run even pace almost the entire way, and move forward steadily in the second half of the race. Sam proved that he is a legitimate candidate to join Kieran in Atlanta, and with this huge confidence builder and another cycle of solid training under his belt, I very much like his chances to qualify the next time out. Dickson ran the best race of his long career, with an outstanding PR of 2:28:01. To put into context just how impressive that is, Dickson's previous PR of 2:29:06 is from 2006, and in the interim he has run many marathons, and logged tens of thousands of miles, but despite his best efforts, he had not been able to improve on that venerable performance until now. Dickson has been in great shape many times during that period, but he brought a different kind of urgency to this training cycle, and his intensity and focus paid off big-time on race day. For Dix to be able to PR after 12 years of trying, at age 37, while working a demanding job with a youngster at home, is a true testament to his dedication to the sport, and I could not be more proud of his great performance. Evan ran a very strong 2:29:36 in his last race for GRC, as he is off to pursue fame and fortune in Denver. Evan and I have been working together since before I started with GRC, and it's been my pleasure to see his dedication and intensity over the last 9+ years. He's been a great teammate and role model for the younger guys, and I'm sure I speak for everyone when I say I'm going to miss him. On the women's side, Hallie ran a huge PR of over 8 minutes, finishing in 3:00:01. Hallie was justifiably thrilled with that breakthrough performance, and her big PR was well-earned after an outstanding training cycle. Very nice work! It wasn't all good news at CIM unfortunately, as Mark and Sean both had promising races get away from them after 15 miles, proving once again that the marathon can be a cruel event. Both Mark and Sean were very well prepared, and deserved better. They'll both be back, and the big PRs will come. We also had excellent performances at CIM from several former GRC superstars. Teal ran a major PR of 2:39:08, and the only bad part is that it's going to be tough for me to figure out how to take credit for that outstanding performance (but don't worry, I'm sure I'll think of something). For the men, we had very nice PRs from David McKay in 2:24:30, Balmer in 2:27:41, and that other Sam from Cornell in 2:27:57. For the real old-timers, Patrick Reaves ran an outstanding 2:17:40, and qualified for the Trials for the first time. Mazel tov!"